FEW festivals have quite the range and diversity of the London International Arts Festival (LIAF) as it plays host to popular Indian band, Indian Ocean and also features the more rarefied beauty of Carnatic music. Running over four days between November 2-10, it seeks to bring communities together and let them share in the different cultural heritages that make London, perhaps the most diverse city of its kind anywhere in the world. This year there are artists from India, the US, and the UK and the festival has grown out of serving communities in East London. Embodying that diversity and a certain eclecticism is Jyotsna Srikanth (pictured above) herself, a medical consultant turned full-time musician and cultural curator. She is the festival director of LIAF and holds the title of artistic director of Dhruv Arts, which is the umbrella organisation behind the festival. This year the Kenneth More Theatre in Ilford will be used. In addition to Indian Ocean playing at the Rich Mix next Friday (November 8), there is also heavy demand to see two big South Indian stars. Shobana, a well-known actor and dancer from Kerala, presents a two and half an hour Bharatanatyam (classical) performance this Saturday (November 2) and Unnikrishnan, another well-known figure from the same state, sings Carnatic vocals. “There is a lot of demand for tickets for them,” Srikanth revealed. “Our aim is to introduce audiences to different types of music, both Indian and other,” Srikanth continued. Greek fusion music and a Polish band are just a couple of the other ethnic sounds you will hear at LIAF this year, as well as the mixed up rhythms of Shanti Shanti Shanti, influenced by Cuban, African and Jazz music. They close the festival next Sunday (November 10). “We want to introduce different music to Indian communities as well introduce Indian music to others,” explained Srikanth. Last year LIAF pulled in around 4,000 people and hopes to expand on that number with the doubling of venues and the increase in performances. Dhruv Arts have been around since 2004 and has been staging concerts and similar events and have since made the leap into festival territory. 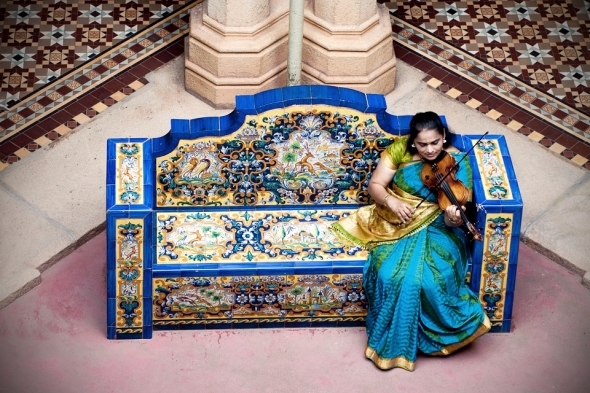 Srikanth is a well-established violinist who straddles genres, playing both contemporary and classical, and has played music for over 200 Bollywood films, as well as written scores. She presents ‘Bangalore Dream’ on the same Friday Indian Ocean play at the Rich Mix. As a practising musician herself it helps to sell the festival to performing artists. Performers are more ready to invest time and effort, knowing that the aim of the festival is ultimately to widen appeal and interest, rather than simply make a financial return. There are also workshops and other initiatives aimed at children, as well as other attractions including food and shopping.